I’ve got a confession to make. I’m not crazy about eggplant. It’s bitter. It’s sort of rubbery. And when you add it to most dishes all it really adds is texture. I’m sorry if I’m offending anyone with these comments. It’s how I feel, and I suspect I’m not alone. I’m talking about you Europe, the Middle East and Asia! People in these parts of the world eat a lot of eggplant. The vegetable even gets a big name in several classic dishes, but it never does much more than lay there and take on the flavor of whatever it’s cooked with. In the Greek dish Moussaka it reflects the powerful taste of the lamb. In the Middle Eastern baba ghanoush eggplant adds heft to the puree but only mirrors the flavors of the garlic, tahini and lemon. Even in the Italian eggplant parmigiana, the full-bodied vegetable disguises itself in the process of breading and frying to become a beefy canvass for the cheese and tomato sauce. Known as aubergine in England, the eggplant comes from the nightshade family. It’s a second cousin to the tomato. Unlike the acidic and sometimes dominant tomato, however, the eggplant is submissive. Perhaps this is why the eggplant has never been a big seller in the US. We don’t like wimpy things and we certainly don’t like wimpy vegetables. Give us onions all day long, or peppers or tomatoes. Can you say salsa? How about ketchup? But eggplants? We’d rather just beat up on them. So why am I even writing about this vegetable, let alone cooking a soup with it? Because there is one, and only one, eggplant entree that I like. And where does this one dish in which eggplant shines like a star come from? In ratatouille the rich, thick, brothy flavor of eggplant stands out. And it only does so if it’s prepared Julia Child’s way. (Wait a minute, whose blog is this?) Julia sautés each of the ratatouille’s ingredients separately so their taste doesn’t get lost in the stew. The result? You can really taste the eggplant. And it’s good. I prepared this week’s Ratatouille Bisque the same way. I sautéed each of the vegetables individually, combined them with the broth, herbs and seasoning and simmered them all together. At the end I added instant polenta to thicken the soup and boiled it a bit longer. The consistency became a lot heartier and the (great) taste of the eggplant still came through. My family’s reaction was mixed. One daughter wolfed it all down in seconds. The others were more typical Americans. My youngest would have liked it better if I melted in some chocolate or brown sugar. My wife was also not terribly enthusiastic. She blamed the polenta. My feelings ran more along the lines of a proud parent. I was really pleased by what I had created and a little contemptuous of anyone who thought otherwise. Come to think of it, that’s not altogether un-American, is it? We all love our children, warts, smooth purple skin and all. In a 3 quart sauce pot, sauté the onion in one teaspoon of the olive oil until tender (5-7 minutes), remove from the pot and set aside. Repeat step one first with the eggplant, then with the bell pepper and set each aside. Combine sautéed vegetables in the pot and add tomatoes, herbs, stock and seasoning. Bring to a boil then reduce to a simmer, cover and cook for another 30 minutes to an hour. Add polenta, bring soup to a boil for 5 minutes or however long the polenta takes to thicken the soup. Serve hot on a cold night or warm on a nice spring or summer evening. It goes well with a tangy goat cheese salad or anything peppery and roasted, or grilled or any other dry cooking method. 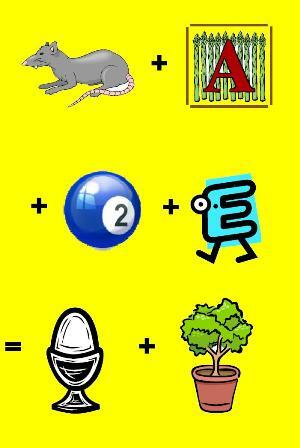 Image Credit: A rebus conceived and cliparted together by the author as a tribute to the old television show Concentration and the puzzles found under the caps of Lucky Lager 12-packs. Aren’t you glad the French finally gave the eggplant a voice? Where’s yours? I’d love to hear it. Thanks for reading. Now leave a comment or tell a friend, or both. I’ll be reading and responding. An excellent recipe and commentary. I got all the way to the bottom and saw mention of Lucky Lager! Ah, childhood memories; trying to figure out the puzzle on the cap while my dad drank the beer (and maybe let me try a sip). You are always asking for comments and requests; here’s a possible one; anything cooked with beer! For example maybe a stew with beer in it, or clams, or fish sauteed in it, or bbq or chowder or whatever; I don’t know, you’ll choose something better than I can. And will it be a thick dark beer? A light lager? Anyway, just a thought. Now I am going to get some Lucky Lager. Great idea, James. I have done some cooking with beer, it might make for a great cabbage soup or maybe a good German bean. The sky’s the limit. Although, on most days, my limit’s two. My in-laws use eggplant in a number of dishes, and I just end up avoiding those, unfortunately. This though sounds very intriguing. Loving the blog, by the way. I think your in-laws dishes sound intriguing. What do they make? Curries? Pickled dishes? I’d really love to know. Thanks for reading (and loving) the blog by the way. I really appreciate it and the comment. Keep ’em coming. I know I will. I think I struck a nerve with this one. Someone else commented that it was about time someone told the truth about eggplant. Whether or not you agree. The soup is pretty good. Even without the polenta. But it becomes a lot heartier and rustic with the cornmeal in there. Thanks for the nice words. I think that fried polenta croutons in this soup would be a great idea. I was thinking about that myself, but didn’t want to add too much more complexity to the ratatouille making process. I’m trying to keep these quick and dirty. Hey there, Phil. Nice article – i do have an eggplant recipe that even HATERS of eggplant love. It’s from the wei-chuan cookbook = chinese cooking volume ii. you take the chinese eggplant – halve them, score the skin side diagonally (both ways) about every 1 1/2″, then slice them about every 3″. Steam till soft. make a sauce of chinese toasted sesame paste (芝麻醬) 2 Tbsp, Soy sauce – 4 Tbsp, sesame oil T Tbsp, minced garlic 1 Tbsp, black rice vinegar (鎮江黑醋) pour over eggplant – serve hot or cold. i have some news for you as well – regards to C.
Hey, Jerome. Thanks for the recipe. I will have to give it a try. It sounds great. In truth, I really like most eggplant dishes from Asia and India. Thanks also for making me come clean.